Deep Ducks — #HacktheHub 2018 winners! Ready Reviews processes reviews as they are being typed and aims to detect shipping and customer service issues in them so that the user can be directed to the correct place to resolve their issue. It also scans the reviews for personal identifiable information and offensive language. Jack, Rory and myself took on the Bazaarvoice challenge #2, which was to analyse review content and identify facts, resulting in meta data. Our solution to this problem was to create a Django application which was able to analyse the content of the review text in real time. Meaning, as the review was being typed, the application would be analysing the text to get an understanding into what the user was suggesting. In order to analyse this text, Bazaarvoice provided us with a large labelled data set consisting of previous customer reviews. From this data set, we were able to train multiple machine learning models to classify the text. From these models, we were able to generate predicted ratings to investigate whether the review and star had a fair reflection, predict whether or not the review would be helpful to future customers, detect personal identifiable information (PII), such as a phone number or email address. 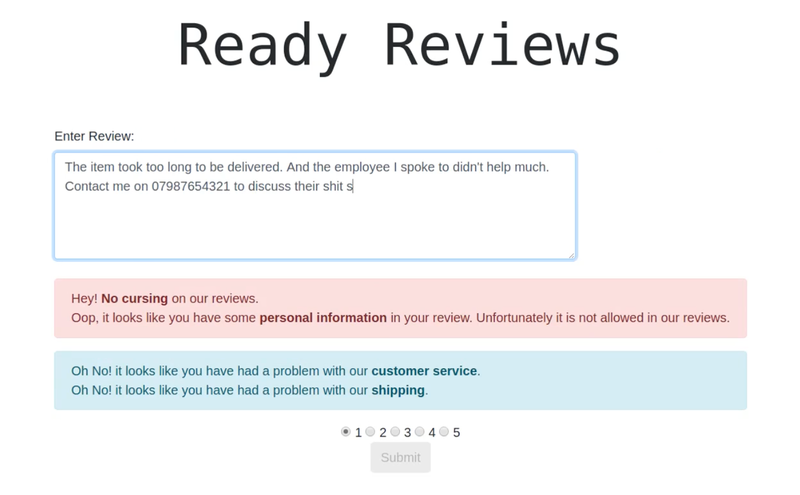 The tool is also able to predict whether the text is relating to a customer service or shipping issue, in which case, an appropriate message would be displayed to the user with details on how they could address this issue with the retailer, and try and find a convenient solution to the problem. The tool also detected vulgar words, which could be inappropriate or offensive to any future users. 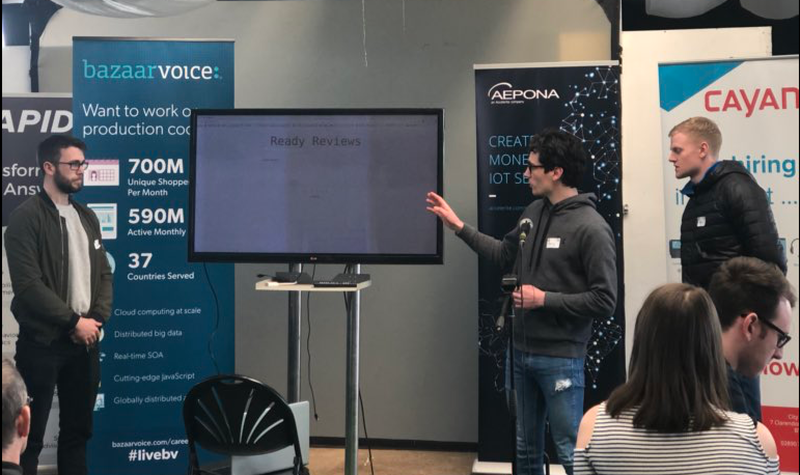 Our solution will result in less need for manual automation for Bazaarvoice by being able to use machine learning models to analyse text, better quality reviews for retailers by alerting users in real time on potential problems with their review. It will also give the user a better experience with each retailer by detecting potential issues and providing them with the appropriate details on how they would find a solution to this issue. HacktheHub provided us with a great opportunity to meet with tech companies, students and professionals from the local tech scene, while also enhancing our knowledge and skill set. 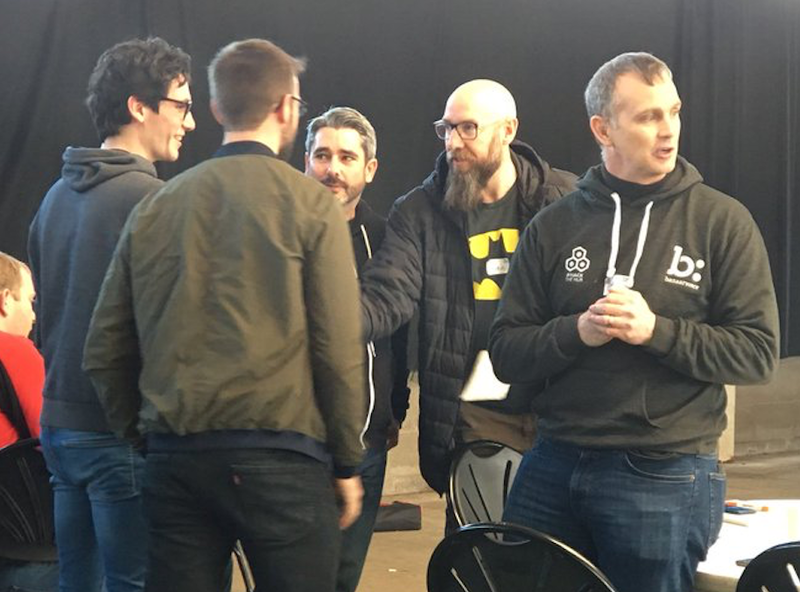 Big thanks to everyone involved with organising the hackathon, and to the sponsors for giving up time and resources to help out throughout the weekend.